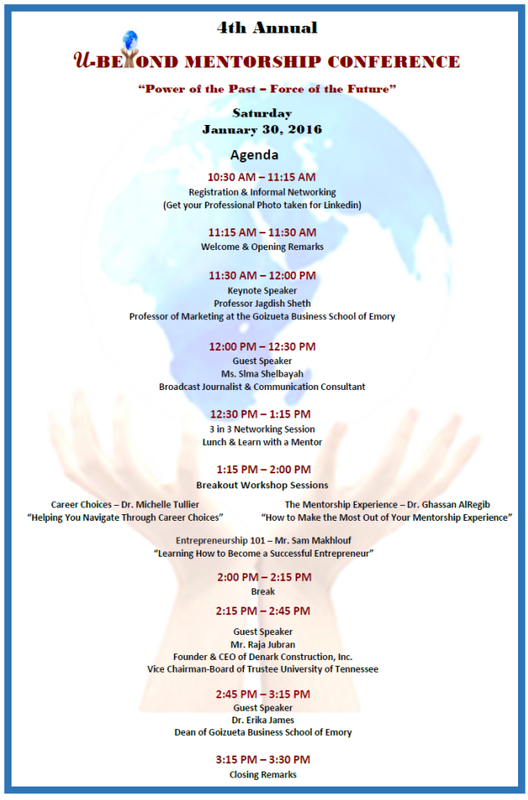 On January 30th, UBeyond Mentorship held its 4th Annual Conference in Atlanta. The event was a smashing success with over 230 people in attendance, consisting of students and business professionals representing various areas of expertise, industries, and interests. Dr. Jag Sheth, Professor of Marketing at the Emory University Goizueta Business School, shared a futuristic look of technology and the world population, and how changing demographics are impacting the future of the human race. Ms. Slma Shelbayah, an award winning CNN Producer and Writer, shared her views on 'tenacity' and how to overcome obstacles. Mr. Raja Jubran, CEO of Denark, and self-made billionaire, shared his views on what it takes to be successful, and how life-work balance is more about choice and the trade offs we make. Dr. Erika James, Dean of the Emory University Goizueta Business School, shared her inspirational journey with the audience and how mentorship has impacted her life. Our trademark, the 3 in 3 Networking session, was a success and connected many mentors with mentees. You can watch all the sessions and interviews, and view conference photos on our website, YouTube channel, and Facebook page. Thank you for making the 4th annual UBeyond Conference a smashing success.